Material: Wool Blend, Outer material: 50% Wool + 50% Polyester, Lining: 100% Polyester, feel soft and comfortable. 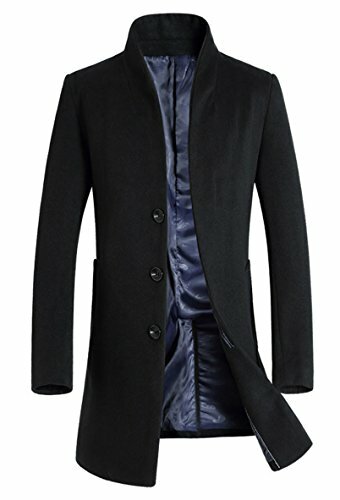 Long sleeve, mid-long style, unique collar design, single button closure, two hand pockets, casual cuff on sleeve, slim fit, all designs fashion and easy, show man elegant charm. Various colors, lightweight and modern design overcoat for spring, fall and cold winter. Suitable for casual wear, business, dates and parties... any occasion is perfect. ❤ This products has"Vogstyle" logo package, if no this logo, you can report to Amazon as it is fake products. If you have any questions about this product by Vogstyle, contact us by completing and submitting the form below. If you are looking for a specif part number, please include it with your message.